Winner of the 2013 Herblock award; 2015 Society of Illustrators Silver Medal recipient; 2015 first place AAN award for cartooning; 2015 Pulitzer finalist. Hey! Don't forget to visit the online store for t-shirts, plush Sparkys and all-new dry-erase boards! NEW: if you missed the Kickstarter for 25 YEARS OF TOMORROW, not to worry! IDW Publishing has just released a second, expanded edition! And of course the most recent trade compilation, CRAZY IS THE NEW NORMAL, is still available as well! If you really want to support TMW, please consider joining SPARKY'S LIST, my subscription email list that gives you a sneak peek at each week's cartoon! READ THE LATEST CARTOON Mondays at Daily Kos and Tuesdays at The Nib! 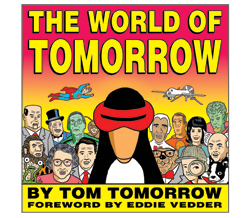 Follow me on Twitter (@tomtomorrow) and on Instagram (@realtomtomorrow)! â€” am listed as comics curator for Daily Kos. In reality, I stepped back from day-to-day operations several years ago and am currently just a contributor. â€” says I run on CREDO comics section, which hasnâ€™t existed in a decade, and has no mention of running each week on The Nation, The Nib, Truthout and Alternet. â€” mentions the online animated series but no link to the actual animations, here. â€” Entire career section basically consists of (1) the fact that I ran in US News for 6 months in 1998, (2) once worked on a movie idea with Michael Moore (the entry could definitely lose that long, irrelevant quote from me about a 16 year old project that didn’t get made), (3) had a bit on Keith Olbermanâ€™s old show once, and (4) got dropped by Village Voice Media in 2009. All of these things happened, of course, but it’s a strange way to summarize a career lasting a quarter century and going strong. And the Pearl Jam collaboration seems slightly buried, given what a high-profile experience that was. â€” early versions of TMW first appeared in Processed World in the mid 1980s. â€” began running in the SF Examiner (on the op-ed page and in the Sunday supplement Image magazine) in 1991.
â€” Subsequently moved the cartoon to the SF Bay Guardian where it ran until the paper folded in October 2015.
â€” no mention of my current publishing deal with IDW, or the fact that they are publishing a second edition of my Kickstarter career retrospective, which will be available soon in bookstores. â€” no mention of Sparky’s List subscription service, founded in 2012.
â€” no external link to Twitter account. â€” I’m not sure why thereâ€™s a â€œfurther readingâ€ section whose sole entry is an out of print anthology from 2002. This doesnâ€™t seem to be a standard part of the Wikipedia format, and since the book is unavailable and not online, adds nothing to the entry. UPDATE: many thanks to people who have helped update the page — looks like many (but not all) of these changes are starting to show up. Given that the Wikipedia entry is one of the first things that shows up in a Google search, it’s nice to have remotely close to accurate there.